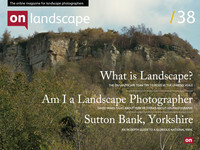 “On Landscape”, is a veritable, virtual on-line temple of landscape photography. So the question posed by the title of this piece might seem almost sacrilegious to some of its readership. Whilst I obviously feel an affinity for the ethos of the magazine and the work presented I seriously wonder if a photographer should be (or even can be) predominantly defined by their subject matter. Schools or genres are of course commonplace in art but photography is amongst the most segregated of all the visual media. There are countless indefinite, and often almost arbitrary, divisions; we are nature photographers, fashion, sport, landscape or portrait photographers before we are just plain photographers. We also divide ourselves into tribes according to usage; we are amateur or professionals (surely the most spurious classification, since the quality of the work is much more important than whether it’s paid for or not) editorial, advertising, stock or industrial photographers (to name but a few). Within each of these divisions there are countless subdivisions and overlaps between specialisms.